An ongoing project that tries to test the potential of a utopian and ecologically-balanced system, like permaculture, to develop through a city and change local planning, urban design paradigms and thinking. Commissioned by Stroom, the Hague, the Netherlands. The word ‘paradise’ comes down to us from the fourth-century Iranian word ‘pairidaeza’, denoting a surrounding (pairi) wall made of a sticky mass (dae- za) like clay or dough – a walled enclosure: the royal parks, military enclaves, menageries and gardens of ancient cities. In early Christianity, the Garden of Eden was considered the ultimate paradise, to be restored on earth in the form of a garden. Paradise was an earthly place, rather than heaven – a state that was within reach as long as all conditions were correct. An early fifteenth century Anabaptist sect, the Adamites, believed paradise could be restored on earth. In order to achieve this, they began to live communally, advocating nudism and free love and the rejection of marriage and property ownership. In the England of the mid 1600s, a group of landless poor, led by the religious reformer and political activist Gerrard Winstanley and calling themselves the True Levellers, also known as the Diggers, occupied St George's Hill in Surrey. They began to farm it, developing ideas for a collective commonwealth while reclaiming what was once common land that had been enclosed by the church and state. In Charlotte Perkins Gilman’s 1915 novel Herland, a society of women live happily in total isolation from the world and from men; they procreate via parthenogenesis and live in a kind of permaculture forest garden paradise. The American writer and historian Lewis Mumford believed that Utopia once existed in the form of the archetypal ancient city – or at least that its after-image does, as a romantic utopian urban ideal that runs through all Utopian literature. Utopian theories and novels from the 1600s to the 1900s are set mostly in urban places in which the garden or farm is central. Many contemporary affinity groups and communities, social movements and alternatives have advocated or do advocate gardening as a central idea for radical social change. In the late 1960s, the anarchist collective ‘the Diggers’ in San Francisco began to develop a vision for the total transformation of social and economic relations, with free food distribution and farming at its heart. Today, the more genteel ‘Transition Towns’ movement – a grassroots network that advocates permaculture as a core principle – is working to build societal resilience in response to peak oil, climate catastrophe and economic instability. In many of these examples, Utopia is used as a tool to critique society and present a possible alternative, which in some cases is enacted. It is through the lens of Utopia that the Edible Park’s ideas are focused. Its aims are to investigate and publish the possibilities of a ground-up, Utopia inspired, sustainable urban planning process. The Edible Park explores what an alternative, or counter, public space might look like, and asks if it is possible to collectively develop a public space that bucks the dominant trend towards the privatisation of everything – a space that is not surveilled or designed to control consumers. It offers another way of looking at the production of social space, our parks and shared urban spaces. In 2008, I was approached by Stroom to propose a project for the Binckhorst area in The Hague for their one-year Foodprint project. The Binckhorst is a post-industrial area near the city centre that was being re-conceptualised as a new creative hub. An imaginative master plan had been drawn up by the Dutch architecture group OMA: a utopian (dystopian?) city concept as amusement park/leisure space crammed with a beach, an outpost of a museum of contemporary art, a Formula One race track and multiple gherkin-shaped skyscrapers. Later that year, the US housing bubble burst and the ongoing worldwide financial crisis ensued. The proposed regeneration of the Binckhorst was cancelled or possibly mothballed. With this as my starting point, I began to wonder what a counter ‘master plan’ might look like. A ‘no- master plan’ from below, a plan without a plan, something that might begin as a conversation developing into activities at a couple of locations and hopefully growing over time into an interconnected, citywide, community driven, biodynamic system. Looking around for appropriate bio-systems, permaculture fitted this idea perfectly. This concept would hopefully be developed in tandem with a self-critical discussion around the nature of public and community-type art projects in a time of forced austerity and economic crisis. Systems like permaculture, forest gardening, deep ecology, Transition Towns, bioregionalism, eco-communalism and urban agriculture – to name a few – are becoming increasingly popular. They are usually regional, small-scale, community driven projects that exist outside and sometimes in opposition to official planning codes, regulations and government departments. In the UK, rigid planning rules prohibit a lot of sustainable eco-building and projects. A Dutch example could be the illegality of building ‘Earthships’: low-impact, passive solar buildings made mainly from recycled materials like cans and tyres, pioneered in Taos, New Mexico, USA. I initiated the project by working closely with Peter de Rooden at Stroom in order to make contact with a local permaculture group. Luckily, in The Hague there was a very good one, and after some discussion of the idea with one of its founding members Menno Swaak, from what was then Gezonde Gronden, now Permacultuur Centrum Den Haag – the search for a location began. To our surprise, we ended up with two potential sites: one in the educational and city farm area of the Zuiderpark, a large municipal park in the south of the city laid out between 1923 and 1936; and the other a fallow, meadow area nearby, at the entrance to a large and well established allotment garden. From there, we began to formulate two different types of gardens that were specific to their sites in terms of character and function. The park plot was thought of as a demonstration or model garden a central location from which a variety of permaculture ideas could be generated. As the site was in the educational area of the park, it would take on the active role of educating the public on permaculture ideas and methods. 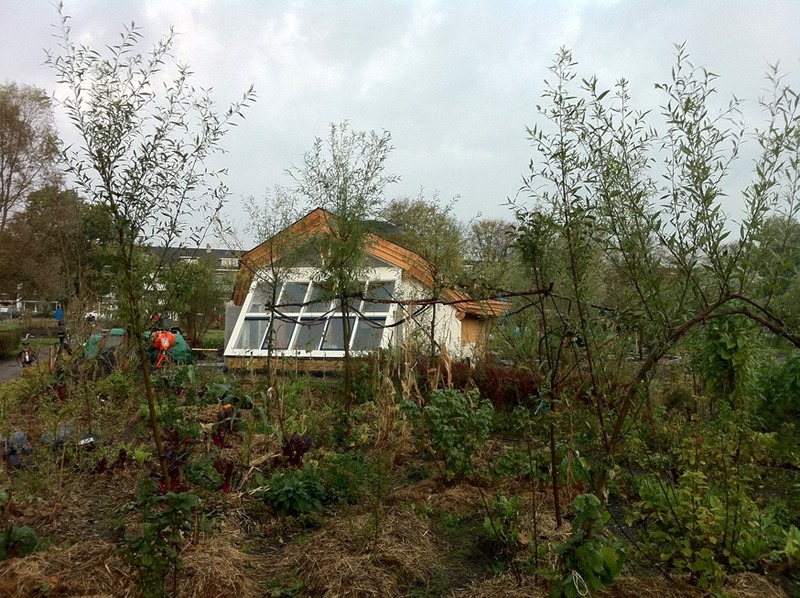 The other, less formal, site at the allotment garden was devised as a permaculture answer to the allotment: a community garden where produce would be gardened collectively rather than in staked-out, individual plots. 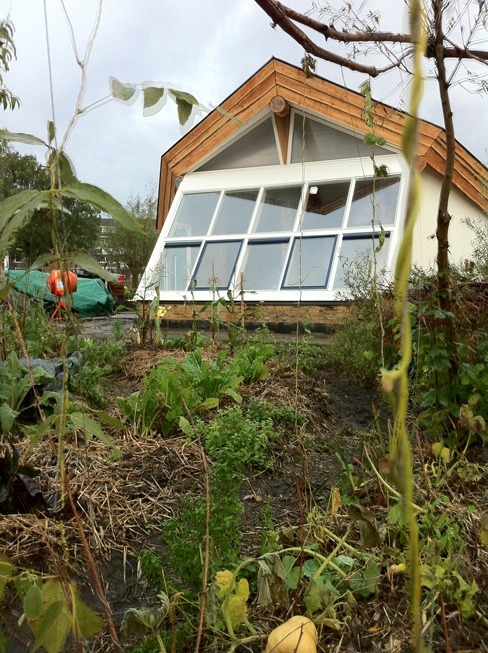 This idea was similar to an existing permaculture garden that had been developed a year before on the edge of the city in an area called Madestein. This thriving garden had been designed by local permaculture students and teachers in a circular, radial layout. As a result of our ongoing discussions, it was decided that the more publically visible park site should include a central structure to hold meetings and workshops, host school groups and store tools and equipment. Working together with the Dutch architect Michel Post, we designed a pavilion based on a building pioneered by Tony Wrench and Jane Faith in Wales. 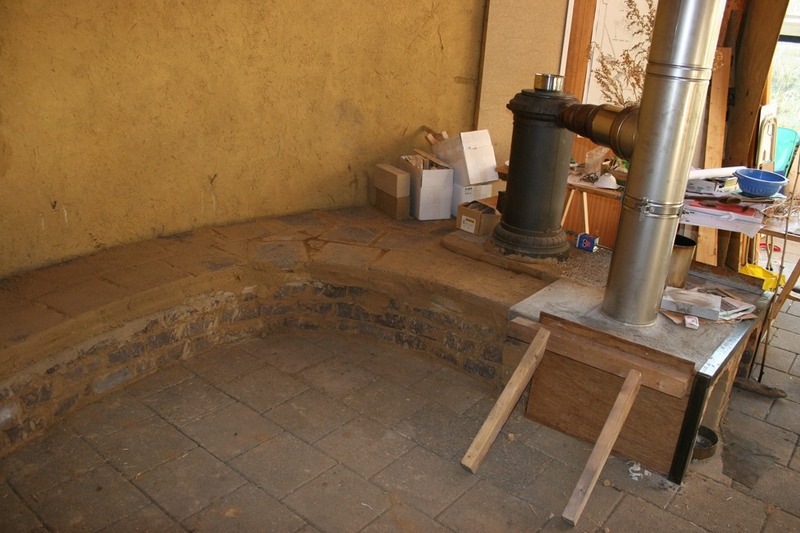 Details of their timber-framed roundhouse built from cob, straw bales and recycled double-glazed windows can be found in their book Building a Low Impact Roundhouse. Taking this design as a template, we brought in references to modernism and the city in order to avoid the cliché of hobbit-like eco-architecture giving it a more urban feel with its materials and details. The modernist reference was the German architect Bruno Taut, who worked closely with the landscape architect Leberecht Migge in Germany in the 1920s. Migge was influenced by the Russian anarchist Peter Kropotkin, developing early models for communal grassroots socialism in the garden design and landscaping for Germany’s large, low-lying social housing projects, or Siedlungen. The final pavilion was a timber-frame construction with a mixture of reclaimed materials, large passive solar front windows, cob, straw bales and shop bought dimensional lumber. The sedum covered roof was a circular timber construction made from whole tree trunks that, in theory, supported themselves by their own weight and radiated from an oculus at the top of the roof. This was capped with a small plastic dome. It was not possible to follow the roundhouse design completely, so we were unable to prove the self-supporting theory local city engineers insisted that one upright column be included to support the roof at the point where we had designed the large sloping front greenhouse windows. 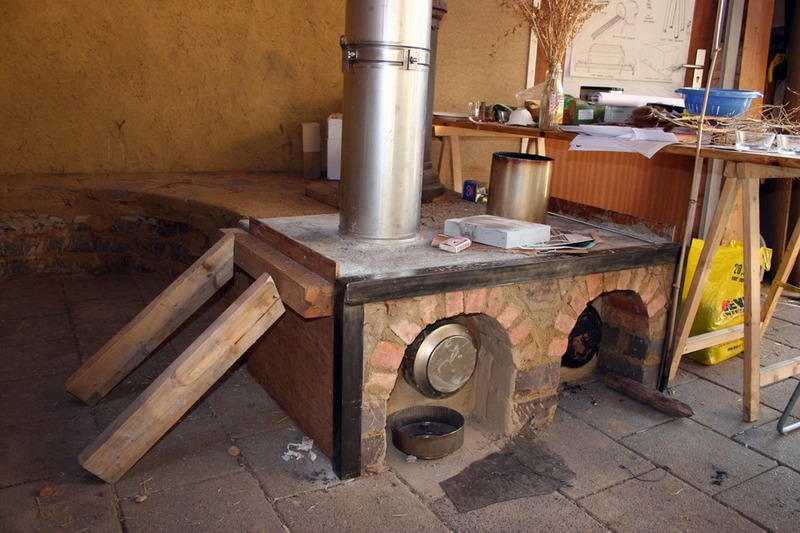 Inside the roundhouse is a large rocket stove with a looped heat duct that is used as an under-seating heat source. The garden which surrounds the pavilion has been designed by students from the local permaculture design course. It is based on a series of circles with a fruit or nut tree in each centre, from which other plants radiate in a variety of guilds and heights. There is a small tiered seating area for outdoor presentations and talks. 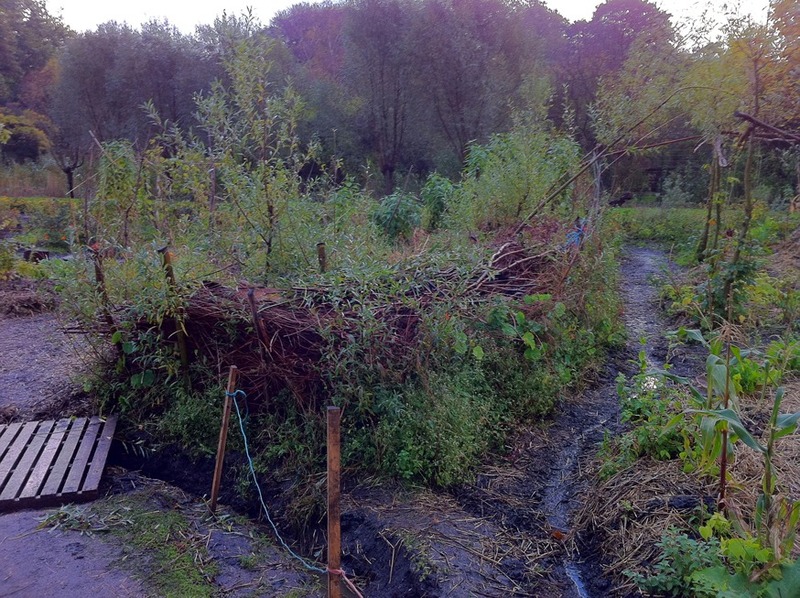 The garden includes composting and water harvesting areas, as well as areas that have been left fallow or are used to store larger woody waste helping to increase bio-diverse edges and wildlife habitats. Future plans include a solar panel, a grey-water waste system and a composting toilet. One of the project’s interesting unplanned developments was the importance of presenting segmented educational workshops. As each stage of the project developed, it was formulated into a practical workshop or learning situation that was open to a variety of groups: the general public, school groups and permaculture students. The garden was designed by the students as part of the permaculture diploma course; they and subsequent students use the garden to further their studies. 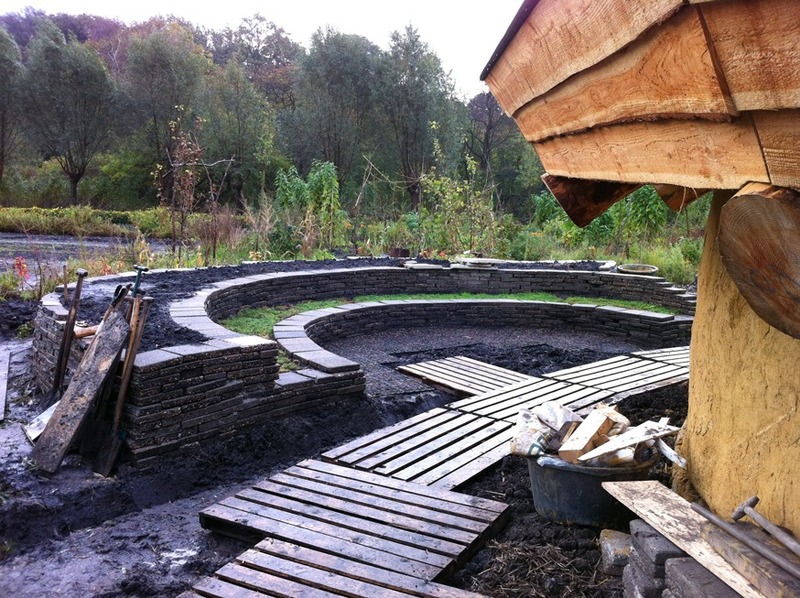 The roundhouse was constructed through a series of building workshops teaching visitors how to make and use cob, build with straw bales and construct a turf roof. Local high school children come regularly to learn about gardening, food production, mulching, composting and other urban gardening ideas. 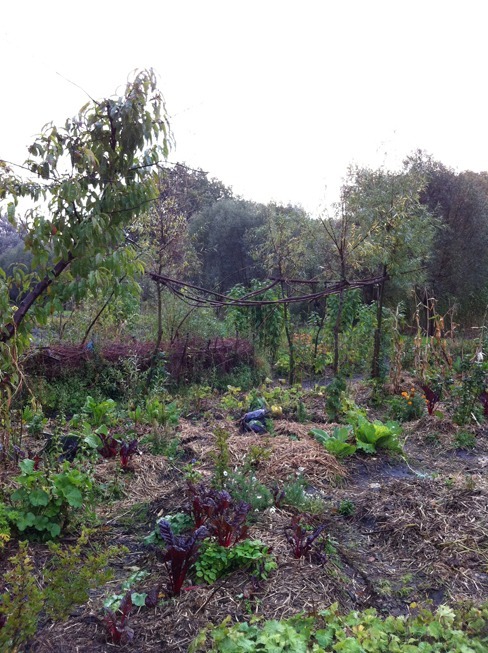 Situated in the park’s educational and city farm area – a common feature in Dutch parks – where conventional gardening and farming is taught, the new permaculture garden creates an arrestingly different landscape. Juxtaposed to the formal lines of monocultural planting patterns, the circles, serpentine pathways and overall informal, wild look of a permaculture garden provides a unique visual teaching tool. At this early state, it is difficult to tell what questions have been, or will be, successfully answered. Ideally, most community-based art projects should be considered long-term processes and commitments. In order for projects like this to have any true relevance or value, particularly those with a garden and an experimental organisational structure, they need time to mature and develop. The park has graciously given us the area to use for three years, and hopefully this will be extended if all goes well. Visually, the garden has become a model for a very different type of urban landscape, especially with its pavilion. It has created a strikingly different type of park space. To some extent, the project may even have been too well received, as the amount of land we have secured may be too much for our small organisation to handle, making the allotment garden site slower to set up. The interdisciplinary nature of the project has allowed us to circumvent various planning codes, allowing, for example, the construction for the first time on Dutch soil of a low impact roundhouse. In most contexts, the building would be considered illegal. We have also redirected and made available various funds to activities and organizations (like Gezonde Gronden) that might not usually have easy access to them, and vice versa – combining and sharing distributed funds that are specifically labelled as ‘cultural money’. The above mentioned educational aspect of the project and the integration of segmented workshops throughout the whole project has been a great success and is something that could easily be reproduced elsewhere. Like all community projects, the pace and urgency of activity changes over time, with its own peaks and lulls. This is only to be expected in this type of volunteer-led organisational form, but it could also be its downfall when working in partnership with an arts organisation at the mercy of state funding dictates when as a result of different operational cultures, expectations, speeds of operating and objectives clash. Finally, these are what strike me as the questions and issues arising from this project and its ongoing process: Can a grassroots, biodynamic system that comes out of a utopian tradition operate citywide, become integrated in the city’s existing planning processes and possibly eventually replace them? Is this in itself a naive and misplaced utopian idea? Does a public art project help or hinder such an endeavour? Can and should ‘socially engaged’ projects effect social change or are they empty, aestheticized signifiers – a new form of artistic realism and content provision for a broader industrialised art market? Lastly, in the context of the current crisis of capitalism that now pervades all of our lives, how much are architects and developers implicated in this collapse? Overbuilding and property speculation are central to the problem, but rather than blaming individuals or professions, maybe this is the right moment to look at more systemic solutions, or at least alternatives to the serious problems the majority of us now face – a dilemma that brings us back to the journey to the Island of Utopia.